You know it’s Christmas time when you hear the La Mesa-based California Note Catchers practicing holiday music for their upcoming concert, “Holiday Harmonies; Jingle All the Way” on Sunday, Dec. 6. 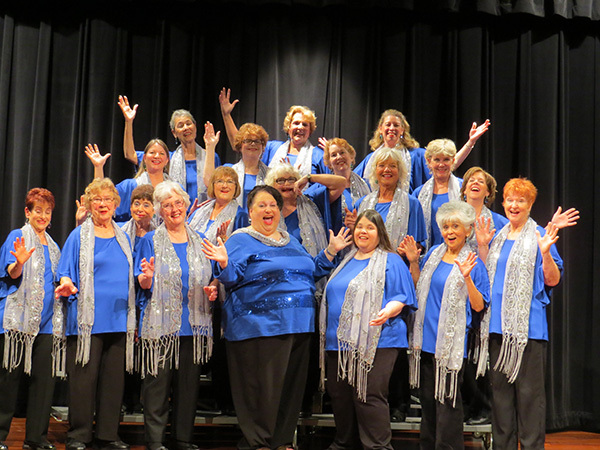 This women’s barbershop harmony group has put on a holiday show for several years. It has grown in popularity so much that the concert now is held at a larger venue, at the Paradise Village Liberty Theater in National City. “Our audience grows larger every year. Many of us also have dedicated family members and friends who look forward to coming every year, some for the past 20 years,” said Note Catchers member Anne Ash. Annette Draper, president of California Note Catchers, said that this year, 19 members will be singing along with three community singers. “The community singers have been working on two holiday songs since the middle of September,” Draper said. The group will sing a selection of secular and more traditional holiday music, including songs celebrating Christmas in several languages, Hanukkah, and the theme of peace. In addition, there will be two quartets singing several songs. The holiday program will also include several songs in different languages. “So we have to master new word sounds. In particular, we sing ‘Mele Kalikimaka’ in Hawaiian and ‘Feliz Navidad’ in Spanish. We also have several soloists performing in different languages during ‘Silent Night,’” Ash said. “We attempt to bring a variety of music for the holidays, not just Christmas carols,” Draper said. In addition, this year’s holiday show will include some audience participation as well. “Over the years, our family and friends have requested a singalong so this year we are excited to have Mark Anthony and Terry John lead a singalong. They are both actors and directors,” said Karen Hasman, a member of CNC since it began 20 years ago. Unlike most choral groups, California Note Catchers’ style is solely barbershop, a musical form that began in the 1930s with the Barbershop Revival Era. The elements of barbershop style and the names of the voice parts are the same for men and women. 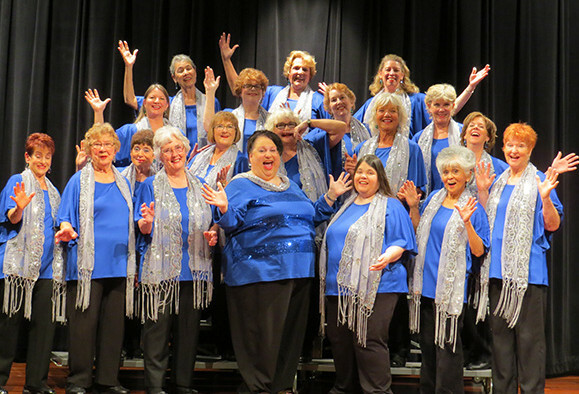 Sweet Adelines and Harmony, Inc., the latter of which California Note Catchers are a part of, are two of the leading women’s barbershop organizations. Barbershop in and of itself is a difficult genre because of the close harmonies, and the fact that it is sung a cappella. “So we are able to educate as well as entertain our audiences. They are usually surprised to discover that many ‘traditional’ songs can be arranged into a Barbershop style,” Ash said. To keep the audience pepped up, the Paradise Village staff will offer refreshments during intermission. After the show, the chorus will be able to greet friends and family. Funds raised from the program assist California Note Catcher’s general fund to help with their monthly rent for practices, assisting with annual dues to Harmony, Inc. and help offset the cost of the costumes. A big part of their budget each year is legally purchasing the music that they sing. California Note Catchers also supports area charities through monetary contributions and occasional complimentary quartet and chorus performances such as Relay for Life and Grossmont Rehab. Women of all ages are welcome to come to the rehearsals and do not need to know how to read music or sing barbershop style. “Once you start singing in four-part harmony, you’ll love it,” Hasman said. Director Randy Parrish-Bell said music has a way of bringing people together. “It affects the entire being – the body, soul and brain. It’s a communication unlike any other form that will get to the emotional state of a person,” she said. The group practices every Monday evening from 7 to 9 p.m. in the Social Hall of the La Mesa First United Methodist Church, 4690 Palm Ave in La Mesa. Tickets to “Holiday Harmonies: Jingle All the Way” are $12 and may be purchased in advance or at the box office before the show. Call 619-889-0299 for tickets. For more information about CNC, call 619-972-7879 or go to californianotecatchers.com. We hope to see many of you there. Thank you to the La Mesa Courier for the wonderful article.